Follow the button below to open the event photo gallery. You will need to have your password that was handed out to you during check-in. 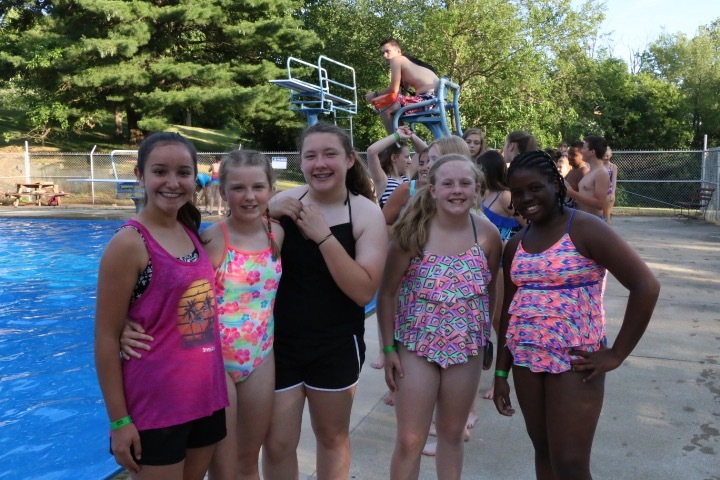 If you have lost your password, please contact the camp office at (574) 834-1300; you will need to verify your identity and connection to a camper in order to retrieve the password. Here's the end of the week video! 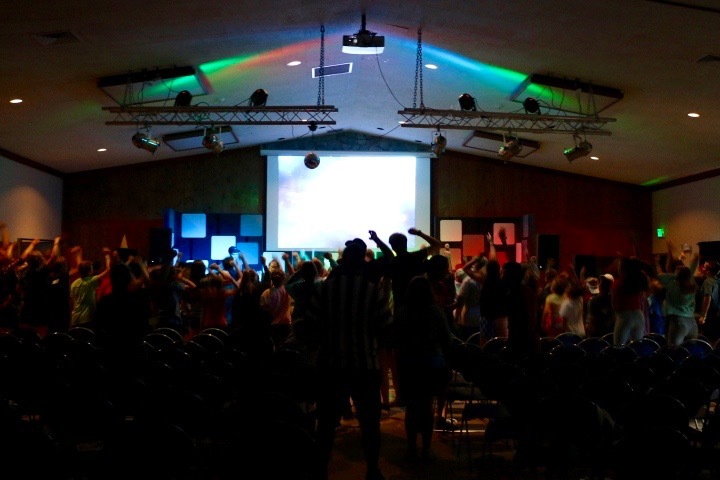 To begin our last day of camp, campers had breakfast and morning worship. They took part in their last cabin devotions and enjoyed recreation time. After lunch campers took naps or began to pack up during horizontal hour. 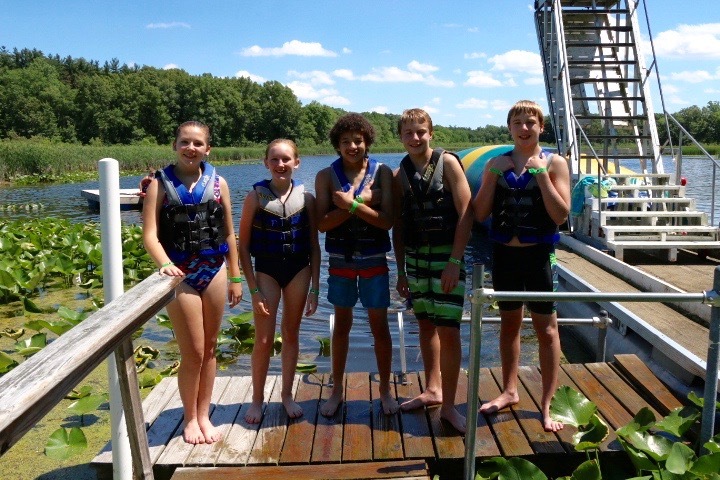 Then they had a rotation at high ropes, low ropes, the blob, the pool, or canoes. Rotations this week were a great way to face fears, to bond with cabin mates, and to have a great time! We really enjoyed them! After rotations campers went to their cabins and began get ready to leave. Then they ate dinner. For our last activity campers played one more valley game. Then it was time for the closing celebrations! At closing celebrations Paul Paschal, our camp manager, thanked parents for trusting us with their children and joked around with parents that now that campers had experienced camp, they would be easier to handle! That got a laugh and then it was time for the campers to come in! Phil Harman, one of our directors, spoke and summed up the week and we watched the end of the week video. Campers exchanged information with their new friends and counselors and headed home. It was an incredible week of camp! 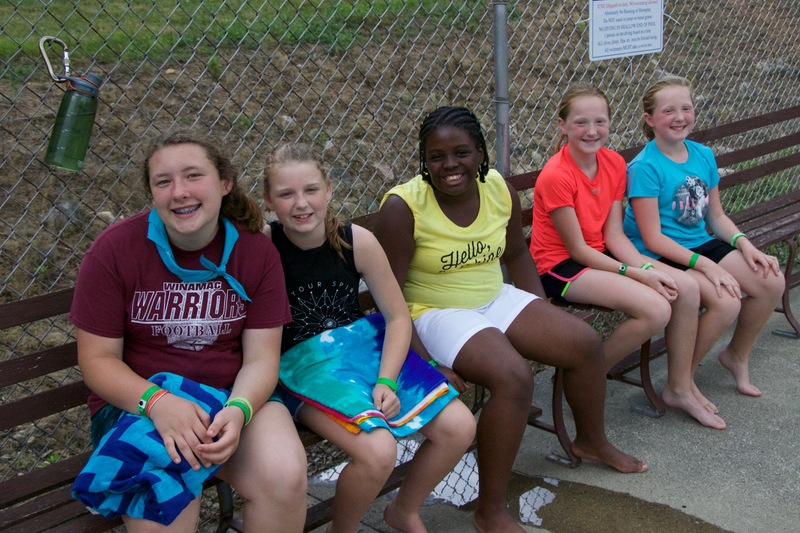 The weather stayed wonderful today and our campers had a great day! For morning worship a guest pastor, Fred Stayton, visited and preached to the campers. Campers then did their morning devotions. Soon it was time for afternoon rotations! Campers finished out their second to last rotations of the week and came to dinner excited and happy. For the valley games tonight campers played dodgeball and then headed to the pool for the evening swim. At evening worship Phil Harman spoke about servanthood. He used the story of the good samaritan to make a point about who our neighbor is. Samaritans were looked down on in the culture of the story and they were seen as lowly people. The injured person on the road was passed by people who worked in the temple and various others who normally would take care of people but the only one who took care of the injured person was the Samaritan. God calls us to serve people who most don't find worthy to be served. All people are our brothers and sisters in Christ and we are called to be disciples of God and serve everyone, no matter our opinion of them. The scripture reference for this sermon is Luke 10:25-37. During worship we sang We Will Run, Grace Like a Wave, Wake, Freedom generation, Never Gonna Stop Singing, Do What You Want To, and We Are the Free. At the end of worship campers were open to serve one another communion. They paired off with another camper, counselor, or staff member and offered them the bread and the cup as a sign of serving them. For our evening snack campers got to go to a big bonfire and make s'mores! They had a blast and enjoyed their snack! Then they headed off to bed. Campers are having a great time, we're not sure they're going to want to come home in a couple of days! This is certainly an energetic, wonderful group of campers! To begin every day, our campers were greeted by the CA staff waving pool noodles and energetically getting them ready for the day! After breakfast campers cleaned their cabins, did morning devotions, and attend morning worship. Then they had cabin recreation time until lunch. At lunch, campers eat and listen to their directors as Camp Beautiful takes place. Camp Beautiful is a camp-wide contest to see who can keep their cabin and the bathhouses the cleanest. Each day the cabin who is deemed the cleanest by the directors wins Camp Beautiful! After lunch, we headed out to rotations! Before dinner, campers clean up a bit and come to Lookout Lodge. As always, the staff game show after dinner was hilarious and fun and then it was time for valley games! Tonight's game was called "Stranded" and campers had to collect plane parts for a victim of a plane crash so he could get back in the air. To get the "plane parts" (actually balloons), campers went to staff members who were set up around the camp and did a silly task as payment for the plane part. One staffer had them finding bugs in the woodpile for a little frog he had set on his shoulder, and another was a musician who had lost her inspiration. To get her plane pieces campers had to come up with a song and dance for her. The twist in this game was that there were native peoples on the island where they plane had crashed and the native people came to take their balloons away! Campers were told not to fight with them, but if they were caught, to willingly give up their balloons. The native people didn't speak english and they were covered in mud chasing them. 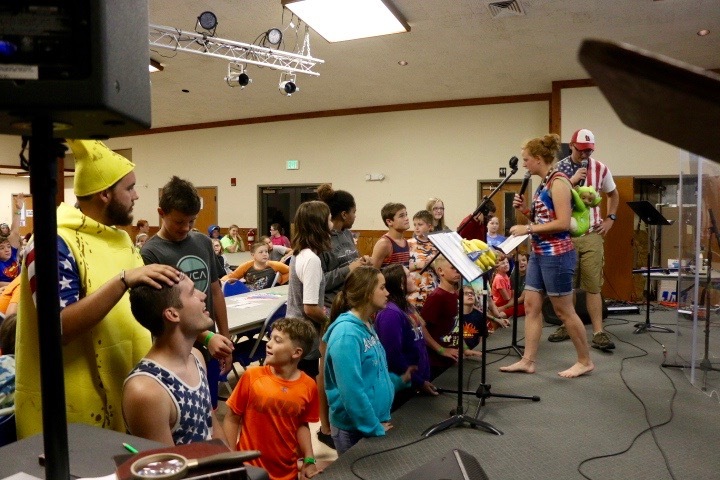 Campers were told to try their best to tell the natives about Jesus! This was a fun game that encouraged campers to remember that there are people in the world who do not look and act like us and that the Lord loves them too. 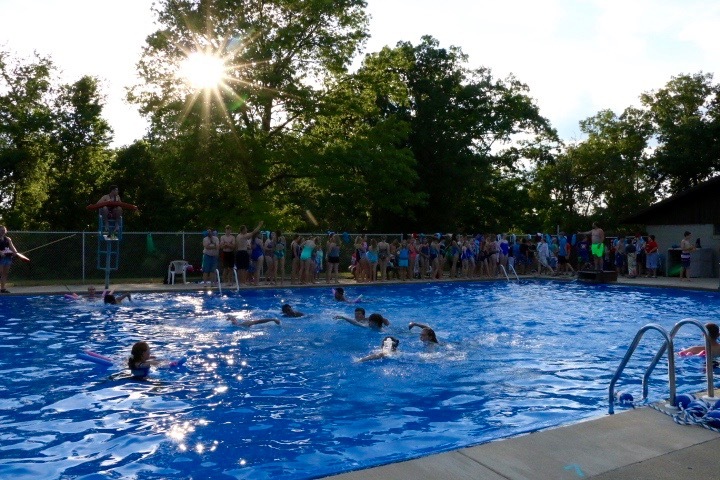 After Stranded, campers went to the pool for about an hour and played counselor ball and jumped off of the diving boards. At the end of swim time they chanted all of our lifeguards on duties names and made them jump into the pool! The lifeguards were great sports and jumped in the pool after hyping up the crowds! At Wednesday night worship we began by singing Happy Day, Wake, and Love Goes On. One of our directors, Phil Harman, preached about the disciples. He spoke about how they were mostly untrained young men, but after following Jesus for three years, they did incredible things in the Spirit and they matured immensely. To finish our time of worship we sang Mighty Warrior, We Will Run, and We Are the Free. After a long and happy day, campers were off to bed. During morning worship one of our incredible staffers and a great counselor shared parts of their testimony with the campers. They shared about walking in the boldness of the Holy Spirit, trusting the Lord, and God's constant presence when we are hurting and scared. 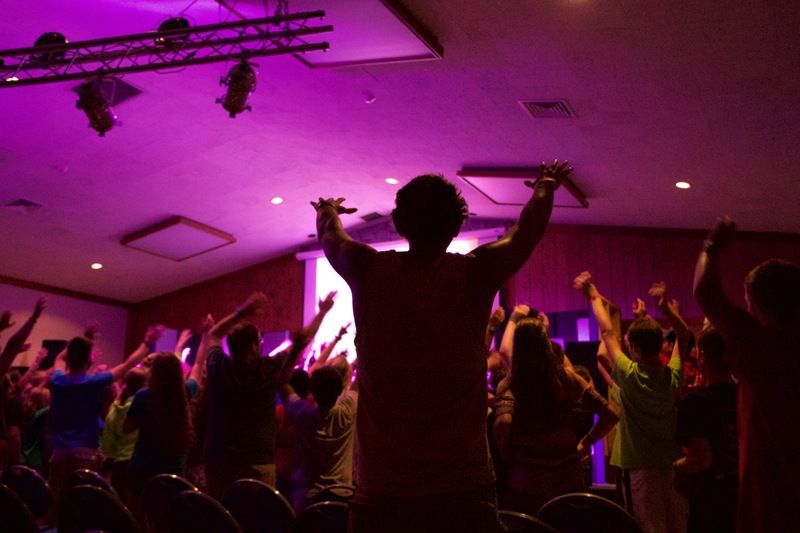 Our worship times have been full of energy and excitement! They are so much fun to be a part of! After worship, we made up the rotations that we missed yesterday because of the rain. Some campers did canoes, paintball, or low ropes and others stayed at their cabins and did their morning devotions. After lunch, campers did two more rotations and had a great time! For our evening activity the campers slid down our giant slip and slide! Then they headed to the pool. Evening worship was a wonderful time as well! We sang Never Gonna Stop Singing, Mighty Warrior, and Do What You Want To. The sermon tonight was about believing even when we cannot see. A counselor and the speaker, Phil Harman, shared stories of when they didn't believe something until they saw and experienced it themselves. There is a difference between relying on your eyes to believe and having faith in believing. Phil used a visual example of smearing mud on the clean white shirt he was wearing. This represented the messes in his life and the things that didn't go well. He said that when we accept the Lord, he cleans up our messes. He gives us a clean white shirt again. Campers had the opportunity to pray with their counselors and staff and ask God to come into their lives and receive a clean shirt. For campers who already have a relationship with the Lord, their prayer was to help them to remember that God loves them and that He is always willing to give us another clean shirt. To finish out the night, campers had a snack and did their nightly devotions with their cabin mates. Today brought some heavy rain showers but we didn't let it stop us from having fun! Campers begin their day with breakfast, morning worship, and morning devotions. Then they have cabin recreation time until lunch where they play outside together. It's a great time of building friendship, teamwork, and having a fun time! After lunch, campers made it almost all of the way through their first rotation before it began to rain. For everyone's safety, we took campers off/out of the the water and brought them inside Lookout Lodge until the storm cleared. This was a long stretch of time so we switched up our schedule a little bit to keep everyone entertained while we were cooped up inside. We have a staff game show that our incredible staff plays with campers each evening after dinner. It is called Bible Quiz and it is set up like Jeopardy. There are fun categories like "Know Your Staff," "Men of the Old Testament," "Camp Trivia," and more! The campers enjoyed using each other as buzzers and listening to our staff's goofy jokes. click here for more photos from the week! After dinner it was still raining so we played more indoor games! We played group charades and a variety of other games until the weather cleared up enough for us to enjoy some time outside. But before we headed outside, we enjoyed evening worship. We sang worship songs and then Phil Harman preached on how to seek God more earnestly. 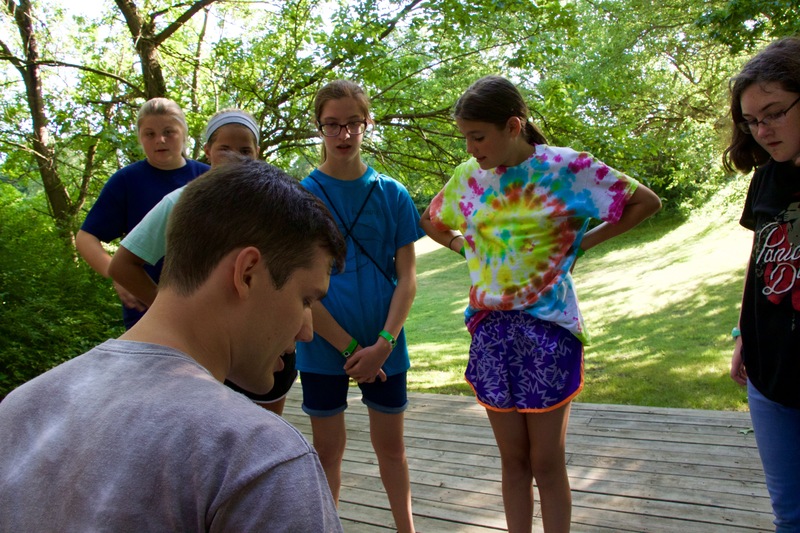 He encouraged campers to keep the word of the Lord on their lips and in their hearts. We should walk in the Lord and learn and grow by obedience to God. We encouraged campers to share their favorite Bible verses and we opened a microphone at the front of the room for individuals to share what verse was important to them and why. Among a variety of verses campers shared Matthew 6:34, Ephesians 6: 10-17, Ephesians 4: 1-2, John 3:30, and John 3:16. Camper's responses were incredible and their reasoning was profound. It was an enjoyable time of encouraging one another. After worship, campers headed to Asbury field and played a game of dodgeball! They ended the night with nightly devotions in their cabin. Welcome to Camp Adventure! 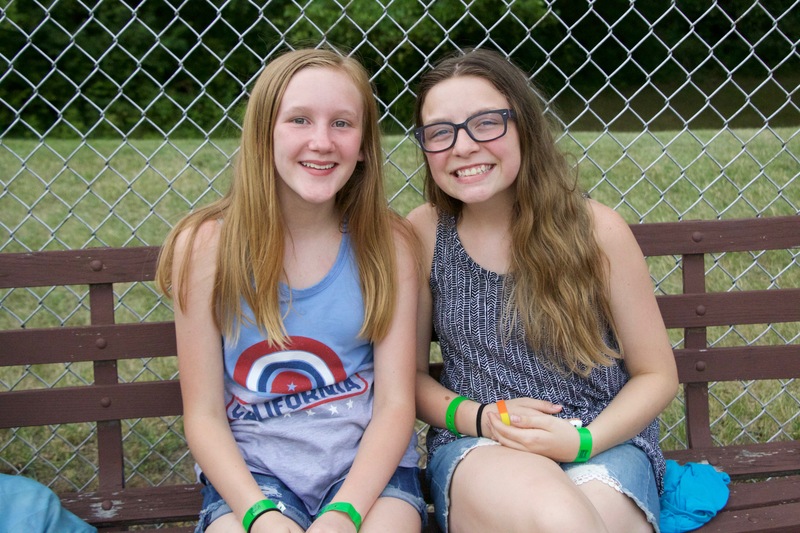 We're so excited for another week of sharing fun, friendship, and the love of Christ with campers! 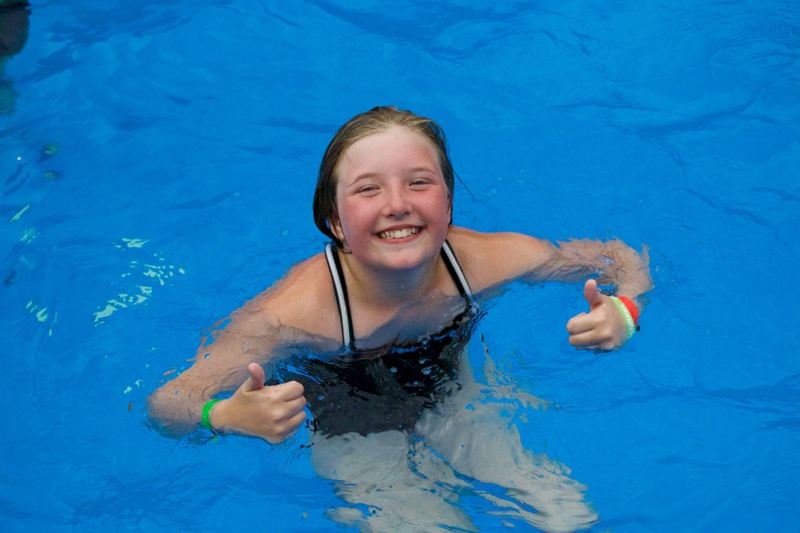 To begin the week, campers took a swim test to determine where they can swim in the pool. Then we began our first evening worship! We sang We Will Run, Never Gonna Stop Singing, and Unstoppable God. One of our counselors brought the hype by sharing an experience he had at Epworth Forest where he dressed up as a Power Ranger with his friends had a great week of camp! He encouraged campers to stray outside of their comfort zone and enjoy trying new things this week. One of our directors, Phil Harman, preached on the difference between seeking and looking. Looking is noticing something and seeking is looking to bring something into your life. When you look for God you try to see Him. When you seek the Lord you go on a journey with Him. To end our evening worship we sang We Are the Free, Love Goes On, and Wake. For part of their evening devotions campers stargazed outside of their cabins and looked at the beauty of what our Lord has created. The campers ended the night with nightly devotions and getting to know one another in their cabin. It was a wonderful first day of camp!